I am a dad who is determined to live life differently. Here is my story. This is a continuation of the previous post (below). Jennifer and I are passionate about identifying the lessons from our journey and becoming what God has intended for us to be. I have learned that through our storm we can accomplish great things – not for ourselves but for one much greater. Ultimately, when we embrace this and make it our practice, many are served – way beyond our own capabilities. I don’t quite understand it all – but catch glimpses of it in the random stories we hear about of lives changed because of our loss and response to it. Tens of thousands of letters and email have flooded our home with powerful examples of this. From medical professionals to politicians, corporate CEO’s to Hollywood stars and all of us “regular” people, we hear of something special that stands out about this journey that impacts hearts from every walk of life. Many have commented on our strength. While we are encouraged by the inference, we realize that it is less about our strength and more about our dependence. At no point has our strength gotten us anywhere. Quite frankly, this has been the weakest time of our lives – full of hurt, pain, disappointment and frustration. Still, we are blessed beyond words and have found great joy in serving through this pain. There is so much I want to share about this – but find my mind and heart distracted. We have been honored to serve many families over the past few years that are experiencing childhood cancer – and many who are caring for a child approaching end of life. It has been a challenging journey as we have set course to organize this effort and help families across the country. We given everything we have to this and in light of the economy have grown a bit discouraged. Then I met Hannah. A few weeks ago, a friend of mine introduced me to a family from Arkansas on Facebook. I learned that this family has two beautiful teen daughters – one of which was diagnosed with brain cancer. We reached out to her family, and quickly discovered that they were very special people! As I learned more about this family, I read a story of how their oldest daughter, Hannah experienced a life-changing time at a church youth conference a little more than a year ago. The speaker shared that God uses storms in our life to bring us close to Him and others closer to God. She prayed that she would experience a storm to do just that. Not long after, she was diagnosed with glioblastoma – a very difficult and deadly brain cancer. Hannah’s approach to her diagnosis was one of clear focus. She had the grace to realize that her battle was scary and painful while at the same time riddled with opportunity to serve God. She seized the opportunities with courage. Her family too has a mindset that recognizes that while personal storms cost us greatly, they can also return great things. A few hours ago, Hannah passed away – not to worry though, she is better now. And while her parents begin to take this new part of the journey in, I sense they realize that the wake of Hannah’s storm is just beginning to reach shore. Good for you, Hannah. Good for you! It amazes me that even in this age of technology and great understanding that devastating storms appear with little warning. The details and depth of impact are not realized until we experience it first hand, in real time. It seems the only thing you can predict is that human response will be remarkable. We often see the very best of and very worst of people in the wake of a great storm. In recent history, Hurricane Katrina demonstrated this well. No one will forget the painful images of men and women unnecessarily looting, vandalizing and assaulting one another after that great storm. On the other hand, the powerful videos of “average joes” risking their own lives to save a neighbor, opening homes and businesses to strangers needing shelter, and leaving stable careers to launch rebuilding programs for the thousands of refugees. Either extreme is remarkable in and of itself and leaves a wake of great impact. Sometimes storms are not made up of rain, wind and lightening – sometimes storms are made up of circumstances that are very personal – and today is a pointed reminder of a storm that my family faced when our son, Ben died of cancer. It has been four years since we laid beside him in our bed, listening to Disney lullaby music , taking in every scent, touch and sound that he made. The ugliness of the cancer in his body was extreme – pain so great that we began to pray for the worst thing a parent could fathom – that God take him away. Those who share in our faith might wonder why that is the “worst thing” – that Heaven is a better place – but something inside me still longs for my son to be here with Jennifer and I. This is a difficult thing to explain – because without hesitation, I know Ben is enjoying things we can only imagine. The conditioned Christian response that he is in a better place doesn’t connect with the daddy in me that hungers to care and provide for my children. I know that someday, when I am there with him, that innate hunger will be satisfied and I will finally “get it”. God promised it. Personal storms may have a lot of spectators, but few experience it. The things that we saw, lives that were changed and impact of each bumpy step of Ben’s journey was carefully connected and orchestrated by God. I mean it. I know this because of the outcome – the evidences that something much bigger was happening through our journey. At times, Jennifer and I were amazed by the way God was using our hurt to accomplish incredible things. This does not mean we were happy about it. This does not mean we were not heartbroken. It does not always make sense, but you know what I’m talking about. After the great loss on 9/11, incredible stories of heroism and hope emerged that inspired a nation like never before. I was there – a part of the horrific recovery work and saw the reality of that day. It was ugly. The things that happened within the boundaries of “ground zero” would eat away at you the rest of your life if you only knew. As great a loss as it was, somehow it drew in a nation and sparked “goodness” like never seen before. Throughout history, there are examples of how incredible “storms” have accomplished great things. For those who experience it first hand, you taste something impossible to explain. You pray for strength to survive the heartache and wisdom to connect the dots and serve God well. For those who were spectators, great inspiration is born. You pray that inspiration sparks change and that you will live life differently because of it. Jennifer is well and the boys are already looking after their sister. I am, once again enamered by this gift - one that I hope to never forget the true value of. Daddy loves you Emmi! For the few of you, my friends that check this blog from time to time, know I would value your prayers as I resolve to spend more time here this year thinking out loud and learning a few new things about myself. Managable steps first... I will be back here this weekend. We are a bit wiped out right now - so forgive the brevity. Nate is doing well - doctors said everything went great and that he will be back to normal within the week. We knew that we would be walking into a place full of difficult memories, but were shocked to find that the room they put us in is the exact one we were in with Ben four years ago - where we were told that Ben would soon die. When the nurse walked in to prep Nate for surgery, she gasped as she saw us - she was the same nurse who cared for Ben for his last surgery. What are the odds? This is a very large hospital - spanning blocks in the heart of Memphis. Jennifer and I knew that we had to remain focused on the task at hand - Nate needed our full attention. All the same, in the quiet moments while we waited our minds raced. Why? 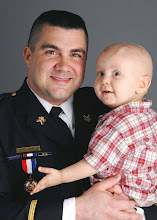 Early tomorrow morning, my wife and I will take our 3rd son (Nate) to a local children's hospital for a surgery. While it is not a critical issue - and we have experienced much more complex circumstances with Ben - our heart is heavy this evening. No parent feels comfortable sending a child off to a surgery - and to give up control to complete strangers. We certainly would value your prayers tomorrow and over the next few days as he recovers. While this is a scheduled surgery - the rush of emotions is far from planned. This is the same hospital Ben endured two very difficult brain surgeries. We will be in the same surgical unit and same waiting area that we were surprized to learn that "it was over" that we should "pack up and take Ben home to die". Jennifer and I remember that day by the minute with such clarity and to walk back through those very doors tomorrow morning will seem like walking back in time. Even writing these words tonight causes my heart to race, a sick feeling to my stomach and a urgent sense of loss for my little boy. I must remain focused for my family - so I will stop here. Please pray for us - for Nate to feel peaceful and be OK, for his brothers not to worry and for us as parents. I am sure you can imagine what is racing through our minds tonight. I will post an update tomorrow night. Good night all. When my "extra measures" didn't ease the terror dreams at night, I would stay up as late as possible - on the brink of passing out from exhaustion - and hope I wouldn't reach a dream state. My acts of desperation to fix myself failed every step of the way. Even so, I pressed on not knowing what else to do. The lack of rest and my hyper-alert state eventually wore on my physical condition and exhaustion set in. As my son, Nate would say, I became a "grumbly bear" (although Jennifer probably has another name for it.) I didn't talk with Jennifer - about anything. My son, Elijah was - well, I don't really know. I was too out of it to remember anything about him or that time. Not long after I returned home from my work in NYC, I learned we were expecting again - another baby boy was on the way. This blog is a place to share bits and pieces of my story - and my commitment to live life differently because of it. All of us have a story. Each is different. One thing is sure - that we have the ability to choose how we live through it. I am no expert in the matter, but I am more aware than ever that I have choices embedded in every step of my journey. I lost my son to cancer - and not a moment goes by that my heart doesn't ache to see him or hear him say "daddy". Watching Ben suffer so long in the end eats at me every day. In 2001 I served on the search and recovery teams at the World Trade Center following the attacks on 9/11. My heart and mind remains heavy to this day. What do I do with this? I am not exactly sure - but I do know that I will not dishonor my little boy by tucking my tail and running. I will not give in to the statistics of failed marriages and addictions. I will look to God, work hard and turn this journey into a tool to help others facing a similar path. I value your prayers and support as this new chapter unfolds.